When I wrote about facial oils a few weeks ago, my sister tried one pictured in the post and didn’t like the scent—said it smelled like hay. I had to laugh since she is a champion horsewoman. However, she liked the concept and found this Rosehip Oil and swears that it has changed the texture and her skin. I, too, tried one that, unfortunately, had a sickly sweet smell and it didn’t seem to help. I’m going to give this oil a test drive. Katresha Divine Face Oil is great! I carry it at my tiny boutique in Middleburg and everyone loves it! 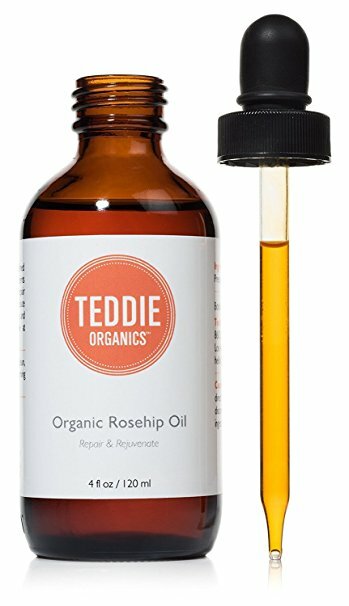 I just want to follow up and say that Teddie’s Rose Hip oil has no scent and has made all the difference this winter! Upstate New York is cold, dry, and windy. My skin is always chapped and raw. Because of your post, I did indeed first try one oil that smelled awful but it made a difference. When I switched to Teddie’s the transformation is pretty startling. No chapped lips, no dry skin. Thank you SO much for your great advice! The Ordinary’s rosehip oil is lovely. Their serums are great too, especially buffet. I’ve been using the Aura Cacia rosehip oil (from Whole Foods I think, but available elsewhere and online) and while it does have an odd scent it doesn’t bother me. It’s been amazing for my skin! I am a former oil slick drying out as I age, so it’s been a great find (moisturizers continue to mystify me). Erica’s comment about no scent was great for me, can’t stand most of the smells. Just bought it – we haven’t had the cold here in LA but it’s so dry, under 30% humidity daily so really need something. Thanks. I love the Suki facial oils, they smell divine. I use the Nourishing as I have dry skin but they have Balancing, Hydrating, Delicate plus serums and masks. And they are made nearby in Northampton, MA! I’ve been a long time user of Dr. Hauschka Clarifying Day Oil. Last year a friend gifted me a sample of Zoetic Petal Drops Facial Oil. It’s fantastic! A bit more moisturizing and more substantial than Dr. Hauschka oil. I now use Dr. Hauschka in the summer and Zoetic Petal Drops in the winter. Some other nice oils to try: Lepaar 24K Precious Oil and Earthwise Beauty Ruby Face Oil. I love Teddy’s Rosehip oil- has completely changed my skin. I use that at night, and then in the morning I use hemp oil that I buy on Amazon by Nutiva. I mix it with frankincense essential oil. Life-changing. I have that oil…I will have to start using it again. Thanks for the reminder! I use Chantecaille Rose de Mai. It is lovely and nourishing. Would love to try Teddy’s, particularly if there is no scent. I have a fragrance sensitivity, and it is difficult to find unscented skincare products for my sensitive skin. Thank you for the tip! I love my rosehip oil! I use Trilogy. I wet my face slightly before applying it- I find it easier to rub in then. I just relocated to Chicago from San Francisco and the winter air threw my skin for a loop. I have been using the goop / Juice Beauty collaboration face oil and love it. It has a fresh clean smell and somehow manages not to be greasy. My serum of choice is a product called “glow” by honeysucklesoap.com in Atlanta. It’s made from the skin of olives. I LOVE it. It literally makes me glow. I get compliments on my skin frequently, and I know that glow is one of my secret weapons at age 54. I’ve been using it at least 7 years. It’s super affordable, and the owner of the company is a delight.–so humble and pleasant.